TO VIEW CART, CLICK HERE Your current cart/basket contents and prices are summarised briefly immediately above. When you have all the products that you require, click on View Cart . You can then adjust the quantities of each product required, select delivery method, do a final check, and follow the link to checkout. N.B. CORRECT APPLICABLE DELIVERY CHARGE WILL NOT SHOW ABOVE UNTIL YOU HAVE SELECTED DELIVERY METHOD. You can buy and pay on-line if you wish. If you prefer to order and/or pay without going through the web site, please contact us as below to place your order and/or to discuss terms. N.B. 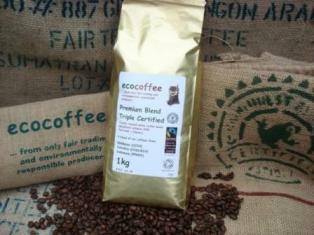 If you are looking to buy coffee in quantities of less than 6 x 1000g or 12 x 227g, please go to our retail site at www.ecocoffeeshop.co.uk . 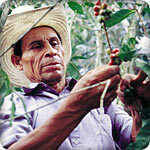 Fairtrade certification guarantees farmers will receive a fair payment for their investment and hard work, regardless of market fluctuations. 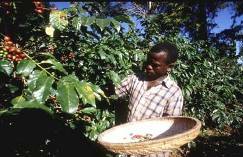 This encourages long term community development and empowerment, and consistent production of the finest quality coffee beans. Our Premium Blend coffee is blended specifically for food service requirements, being especially suitable for both pure espresso and espresso based milky coffees, but also as a longer black coffee.